I have been planning a new exhibition, with an architect colleague Richard Brook from MMU, for the last few months and doing some low-level archival research to find key material to display. The exhibition is called Infra_MANC - for 'Infrastructure Manchester' - and it will examine four key infrastructural projects from the post-war period. There is the iconic Mancunian Way elevated motorway and the 'secret' Guardian underground telephone exchange. 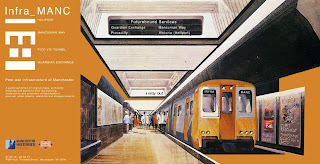 We will also present plans, maps and artefacts relating to two other unrealised infrastructural projects in Manchester: schemes in the 1950s for a city centre heliport and then the underground railway route from Piccadilly station to Victoria (the 'Picc-Vic tunnel') which was planned and nearly built in the early 1970s. We are just in the final push to complete the text for the large exhibition catalogue. Then there will be the panic in a few weeks to get the exhibition material itself installed and ready for the public opening on the 27th February. Hiking by James Walker Tucker, 1936. 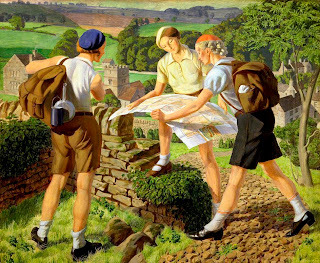 I recently came across this lovely 1930s painting called Hiking while reading Rachel Hewitt's history of the Ordnance Survey, Map of a Nation. I thought this painting would have made for a cracking cover image for our edited The Map Reader volume. It really captures the essence of using maps that we wanted to convey in the cover design. The question of the gendered nature of cartography is also raised, a point that is made problematic by our actual cover photograph showing the apparently active male role, holding map and pointing, and the more passive female. 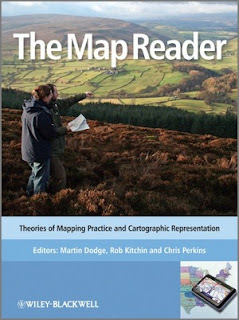 We are getting some good feedback on The Map Reader, although its only sold about 400 copies so far. The electronic version is also very well indexed by Google Scholar, so if you search for many of the key articles the first source listed is The Map Reader version on the Wiley onlinelibrary website. Hopefully some reviews in journals should start appearing soon.